Jarrod Greene is a voice actor and digital video engineer at Funimation. He graduated with a degree in Radio-TV-Film from Texas Christian University, where he worked as a recording engineer and on-air host at KTCU. 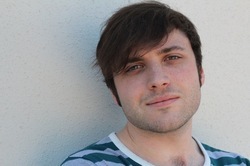 Jarrod started working for Funimation in summer 2010, and began voice acting in 2012. Jarrod's first role was Sado in Level E, shortly followed by Coco in Toriko. He can also be heard in Deadman Wonderland, Is This a Zombie?, One Piece, Shangri-La, Shiki, and Tales of Vesperia.